Independent presidential candidate, MP Salome Zurabishvili visited the cemetery of war heroes at Mukhatgverdi on August 8, paying tribute to the fallen heroes but she accused Georgia of starting the war with Russia in 2008. She underlined that the government knew that they should not have counted on the international assistance when starting the war with the northern neighbor. "When the war began, Georgia did not have any advantage at that time. In 2008, Georgia was warned by all its allies not to take any military steps. Georgia was also warned not to expect aid from its allies in case of war, but then government did not take this into account,” Zurabishvili stated. The MP stated the Russians had military drills on the occupied territories in July 2008 and Georgian government followed their provocation and started the war. 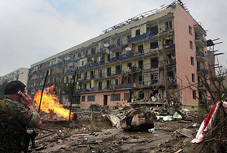 She added that then-President Mikheil Saakashvili began to shell his population. “This was the action of an insane man, who made a strange deal with our centuries-old enemy,” she stressed. This is not the first time Zurabishvili is accusing her own country of starting the war with Russia. While making an official announcement about her decision to run the presidential race this October, Zurabishvili stated that her position regarding the August war is the same, adding Georgia started it. Her statement sparked criticism among politicians, who say her comments damage the country’s image and promote the activities of occupation regimes. David Zurabishvili, the member of the Republican Party, said that the statement of the presidential candidate is equal to sharing the Russian narrative, which has been claiming from the beginning that Georgia provoked the war. “After making such statements there are two options: to be a conscious enemy of your country and direct satellite of Russia's interests in this region, or to be highly unqualified,” he stated. According to him, if Salome Zurabishvili becomes the president, it will negatively affect the country's positions on the international arena, and the country's foreign policy achievements will be destroyed. Georgia lost its 20% of territories during the August war in 2008 after the Russian federation backed Georgia’s two separatist regions Abkhazia and South Ossetia. During the five-day conflict, 170 servicemen, 14 policemen, and 228 civilians from Georgia were killed and 1,747 wounded.